There will be no High School Camp this summer (2015). Please check back for 2016. For runners, mountain tops tell a story of success, create a hunger for more, and a passion for excellence. To the RunSMART team, camp brings new friends, new family and new beginnings! From the summit looking down, athletes start to dream big dreams! Lodging at the state of the art Residence Hall at Colorado Mountain College. Strategies for mobility and flexibility, speed and agility, strength and power, recovery and regeneration. Free time and opportunity to schedule One on One Appointments with coaches and trainers for nutrition, program design, injury evaluations, video analysis, etc. Afternoon Session: drills, speed work, stretching, strength, recovery, etc. Colorado Mountain College in Steamboat Springs offers spectacular views of Mt. 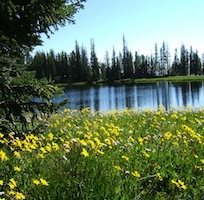 Werner and shares the mountain lifestyle of Steamboat Springs, Colorado. It is one of the healthiest mountain getaways. Summertime brings 50 miles of hiking and biking trails, surrounded by wildflowers, clean mountain streams and awe-inspiring views. The Run SMART Project is a group of professional coaches working together to help runners of all levels reach their running goals. All coaches are current or former distance running standouts. Each coach has experience working with high school and collegiate athletes and can help mentor attendees on proper high school training methodologies and the transition from high school to college running. Physical Therapist, Athletic Trainer, and Certified Strength and Conditioning Specialist. Erin comes from Stanford University Athletic Department where she worked as a Physical Therapist, Athletic Trainer, and Certified Strength and Conditioning Specialist. Her diverse background in both manual therapy and functional rehabilitation enables her to assist every client to return to their optimum. Erin has extensive background in treating clients with diverse injuries and abilities; among these are many Olympians, NFL Players, NHL Players, Golf Pros, competitive runners and amateur athletes. Along with Erin's ability to swiftly return athletes to competition, she has the equal ability to ensure clients can enjoy everyday physical activity. Erin brings an innovative approach to Physical Therapy, Strength and Conditioning and Sports Enhancement which provide her the ability to adjust to all levels of fitness. This approach has produce results. 2008 Olympic Games in Beijing produced 24 medalist from Stanford Athletics along with countless National Champions. Do not wait, let the best physical therapist help you meet you physical goals. Must be entering Freshman, Sophomore, Junior or Senior year in high school to attend. Coaches who bring five or more athletes may attend for free. Contact [email protected] if interested.